Summary of today’s show: When Pope Francis and Ecumenical Patriarch Bartholomew met in Jerusalem in May, they were commemorating the 50th anniversary of a similar meeting between Pope Paul VI and Ecumenical Patriarch Athenagoras, which was itself a groundbreaking historic event. In anticipation of this latest meeting, Cardinal Seán and Metrpolitan Methodios of the Greek Orthodox Metropolis in Boston issued a joint letter to the faithful highlighting just how significant this meeting would be for the future re-unification of the Church in both East and West. 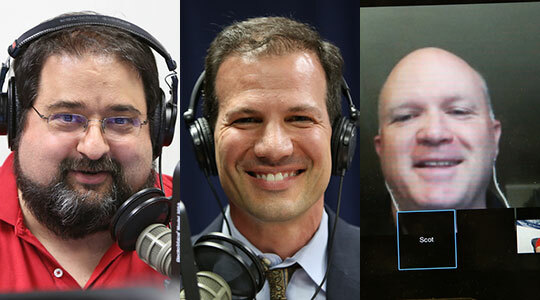 Vito Nicastro of the Archdiocese of Boston’s Office of Ecumenical and Interreligious Affairs joins Scot Landry and Domenico Bettinelli to discuss these significant events, the declaration of the pope and patriarch, and the outcomes from this visit and gatherings. Thank you for covering this topic. My son is a Greek Orthodox priest and we spend many enjoyable hours discussing the similarities and differences in our faith traditions. As progress is made on reconciling the two churches, I think it is key for Catholics to understand not just the history (which is thorny), but the theological and doctrinal approaches that are unique to both faith traditions. We want to talk intelligently and respectfully when we engage in the very dialogue which the higher level conversations between these two faiths have promoted and are recommending.